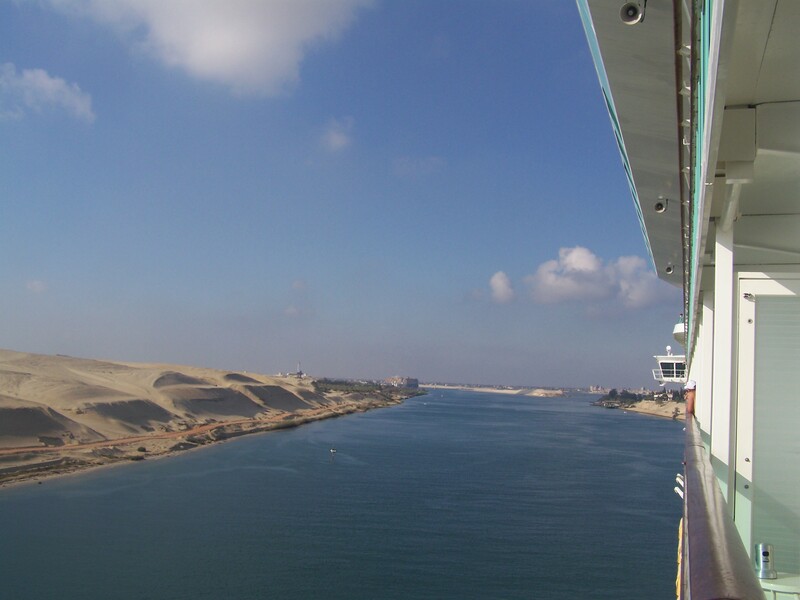 From Alexandria, Egypt, we sailed on The Mariner of the Seas east to the Suez Canal where we cruised from one sea to another! The Suez Canal separates two continents – Africa and Asia. It’s fascinating that after many years of trying to join the east and the west, in 1858 the Suez Canal Company set out to build a man-made, salt-water passage between the Mediterranean and the Red Sea. The canal opened 10 years later making the connection between Europe and Asia possible, without sailing around the southernmost tip of Africa. We entered the canal Sunday morning around 1 a.m., May 12, and could see from our port side balcony nothing but sand – lots of sand! That would be the Sinai Peninsula. From the beginning of the canal at Port Said, through the Great Bitter Lake and ending at the City of Suez, the canal measures more than 100 miles in length. This was a great day to enjoy the ship and spend some time on deck! Temperatures at this time are still mild and breezy. Preparing for a big day tomorrow, Monday, May 13 – we’re going to Safaga, Egypt, and then take an excursion to Luxor and the Valley of the Kings!!! Can’t wait!